I won’t dig into detail of all the possible approximation of acos, asin or atan because others like Robin Green’s document  already done it well. I will only focus on polynomial Minimax approximation which seems to be the most efficient method for the GCN architecture. People often heard about Taylor series to approximate trigonometric functions but polynomial Minimax approximations are way better. Polynomial Minimax approximations are typically generated with a variant of the Remez algorithm  and are polynomial that minimizes the maximum error between the polynomial and the function. The Minimax approach try to minimize either the absolute error abs(f(x) – approx(x)) or the relative error abs(1 – approx(x) / f(x)). I recommend to read the nice article of Sam Hocevar about why Remez algorithm is better than Taylor expansion . Various tools such as Maple and Mathematica have built-in functionality for Minimax approximation, and there is some free tools like the Sam Hocevar’s framework call “lolremez” to play with a c++ implementation . However during my test on inverse trigonometric functions, MiniMaxApproximation and absolute error version of GeneralMiniMaxApproximation were providing very similar result. It appear that the relative error is correctly achieve but it is possible to get a better absolute error by playing a bit with the input range provide to the function. 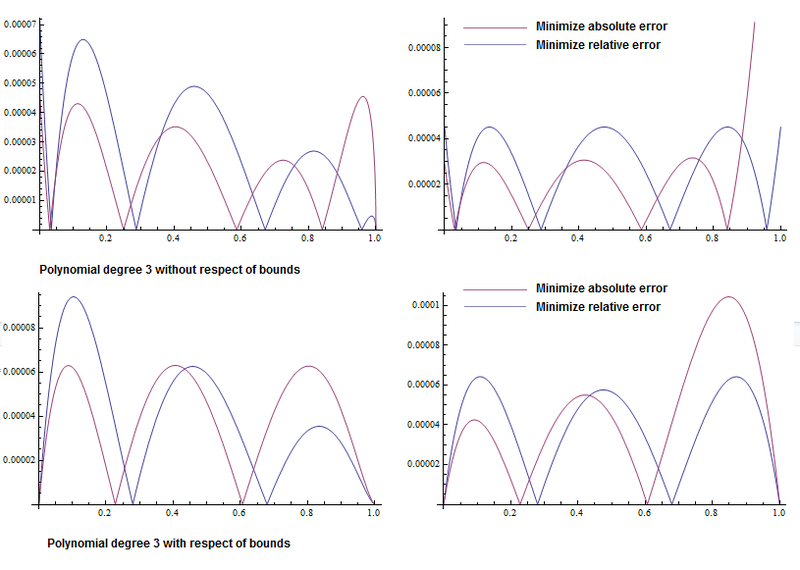 For example the default maximum absolute error on input range [0, 1] for a polynomial Minimax approximation of degree 3 with function GeneralMiniMaxApproximation is 6.7×10^-5, whereas it is 4.55×10^-5 with input range [0, 0.8776]. So in this post I use MiniMaxApproximation on range [0, 1] to get maximum relative error and absolute version of GeneralMiniMaxApproximation where I tweak the the input range to get the maximum absolute error. Should we use relative or absolute error ? It depends on what we are looking for. As we focus mainly on visual, I think relative error is a better choice but I provide result for both in this post. And recall that an odd function is f(-x) = -f(x) and an even function is f(-x) = f(x). This is interesting because an odd function can be approximate with odd polynomial (polynomials that only use odd powers of x, such as x, x^3, x^5). acos is approximate in the range of input [0, 1] then we use the identity acos(-x) = PI – acos(x) to get the [-1, 0] range. atan is approximate in the range of input [0, 1] then we use the identity atan(x) = PI/2 – atan(1/x) to get the [1, infinity] range. Last step is to negate the result to get [-infinity, 0] with the identity atan(-x) = -atan(x). 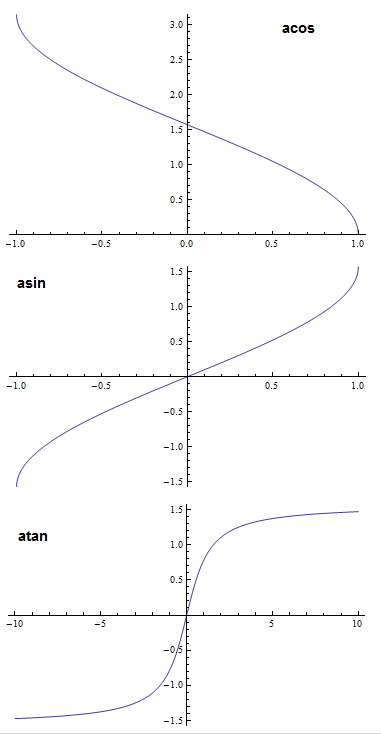 Alternatively atan can be approximate in the range of input [-1, 1] then we use the identity atan(x) = pi/4 + atan((x – 1) / (x + 1)) to get the [0, infinity] range. Last step is to negate the result to get [-infinity, 0] with the identity atan(-x) = -atan(x). Remark: If you do not use the full range of input for your use case you can save several instructions because you don’t need to undo the range reduction step. For example if you know that your atan input are always positive you don’t need to perform the last negate base on the input sign. The code contain one atan and one acos. I have write a framework in Mathematica to help optimizing the inverse trigonometric functions by testing quickly various polynomial degree for the approximation with various option. The Mathematica file is provide at the end of the post. Following section will provide more details on the optimization process of each function. But sometime the function we want to approximate can’t be represented easily with only a polynomial. This is the case of acos. 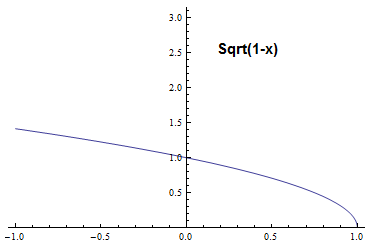 The curve on the [0, 1] range of the diagram in previous section looks like more a sqrt(1-x), see the graph below. David H.Eberly in his GPGPU book  provides some information about why sqrt(1-x) is the function to use. The polynomial Minimax approximation provide a set of coefficients for p(x). In the following I will present different result of coefficients set for various polynomial degree with associated maximum absolute and relative errors. The GPU code and the cost is the same for a given degree. Below there is the optimized GPU code for GCN architecture and the AMD GCN ISA for first 3 degree. In all inverse trigonometric code I rely on the ternary operator ? : to map on a cmp and a cndmask which are 2 FR, check the assembly to be sure your GPU compiler do it. Remark about the ISA GCN code: As you can see a mad with two constant can’t be executed in a single instruction. This mean that we need to store a constant in a register before using it in a mad. This is why we have a lot of mov. And this is also why each new degree add 2 FR (one v_mad and one v_move) Sadly, our approach is plenty of this case and it is difficult to generate immediate number for the coefficient like 2, 4 or 0.5… For more details about constraint of mad, see the great talk of Emil Person . The abs is free and the sqrt cost 4 FR but provide a better accuracy and is cheaper than increasing the polynomial degree to a large amount. The first row is a sphere lit by a 1m sphere area light, the second row is a sphere lit by a 10cm sphere area light. Only diffuse lighting is show. The acos call of the original function has been replace by ACos polynomial of degree 1. Difference are extremely subtle (image quality here is too bad to see anything). The absolute error has almost double. First part ensure that p(0) = A, second part that p(1) = B and last part is a new polynomial chose specially to be 0 for 0 and 1 to not perturb p(0) and p(1) values (Thanks to Sam Hocevar for explaining me this method). As we can see, taking into account bounds have an impact on the precision, requiring to have correct value at bounds depends on usage. The process to optimize asin is exactly the same than acos. However this time we also need to introduce a bias because we will use the relation asin(x) = PI/2 – acos(x) for the Minimax approximation. This version cost an extra 1 FR for the sub. However depends on the context it can be way more efficient. If you call both ACos and ASin in the same function with the same input, it is better to implement ASin as dependent of ACos. The compiler is able to do more aggressive optimization then. But best it to do it manually when required and use first implementation. As always, know what you are doing. This produce the same coefficient than ACos with the same maximum error, except that for the GPU code we will negate the coefficient. We get the same maximum error than Acos. Remark: Like for ACos, we can take into account the bounds. We may think that we will have a gain with ASin version because in this case HALF_PI is present two times so we could save one v_mov instruction. But it is not the case as one of the HALF_PI use an immediate add, so the v_mov remains. I present the 3 different implementation (polynomial, odd polynomial and odd polynomial alternative) because they have different maximun absolute and relative error. Note: if you know that your atan input is positive (like it is the case for diffuse sphere area light), you can save 2 FR by avoiding the final negate of the ATan call. 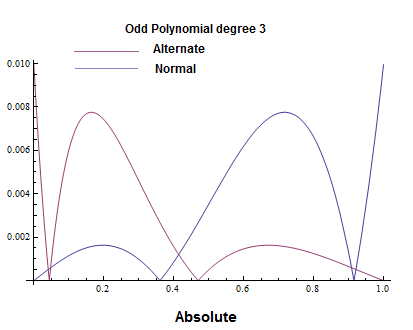 Note that odd polynomial are really more accurate from order 5 at order 3 this is mitigated. This maybe important depends where the precision matter. Another remark is that to respect atan(1) = PI/4 the sum of all the coefficient should be PI/4. For example with Eberly’s coefficients: 1 – 0.214602 = 0.785398 which is QUATER_PI. However the first coefficient is not mandatory to be 1 to respect atan(0) = 0. This version use the same coefficients and have same stretch swapped error than P3. But it still less accurate than a OP5 A for the same cost. The first row is a sphere lit by a 1m sphere area light, the second row is a sphere lit by a 10cm sphere area light. The atan call of the original function has been replace by ATanPos. The second column with the polynomial of degree 2 use the version which minimize maximum absolute error and exhibit banding (not really visible on the screenshot for the 1m but it is really visible in reality). The third column with odd polynomial of degree 3 which minimize maximum absolute error is totally black instead of having a gradient for 10cm light, otherwise the approximation is good. The fourth column with odd polynomial of degree 3 using Eberly’s coefficients which minimize maximum relative error match well the 10cm light and the 1m have some discrepancy not really visible on the screenshot. After inspection the banding region correspond to an input value around 0.1 to the atan function and it seems that it is very sensible to accuracy of relative error. Here is the absolute and relative error of OP3 with mine and Eberly’s coefficients. You can see how the absolute error is better with mine coefficients and how the relative error have a similar maximum. But the distribution around 0.1 is in favor of Eberly which make it behave more correctly for my area light test case. Again the error distribution around 0.1 is in favor of Eberly and even the OP3 Eberly version beat this OP5 around 0.1. Thus the banding seen on the screenshot. To sum up, know your use case and input and chose the best approximation for it. For my area light case, OP3 Eberly is the best despite the number. MaterialFloat3 A = x < 1 ? 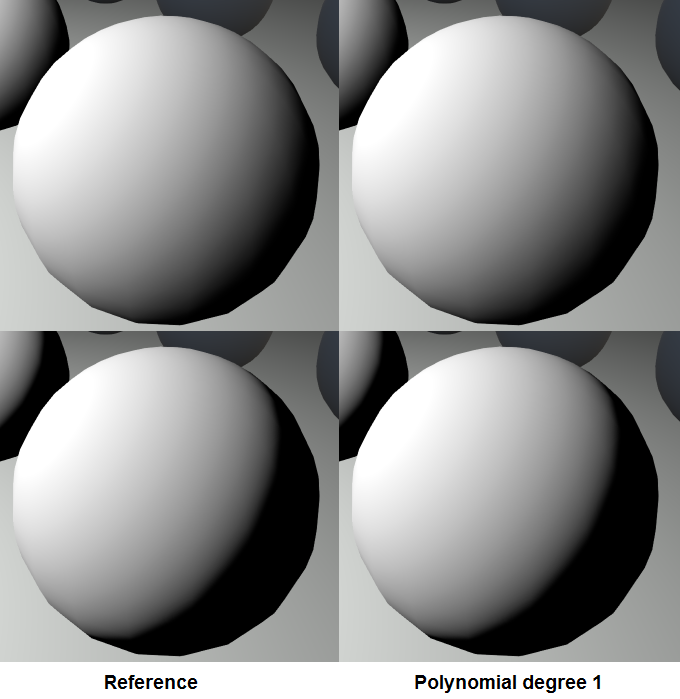 The Unreal engine 4 version is 2 extra FR (This is a AtanPos version) compare to the polynomial positive version of degree 3. This is due to the way I reorder the GCN instruction to be more efficient. Remark 2: Michal Drobot have publish a useful gpu fast math lib . With some inverse trigonometric approximation based on the same kind of approximation method. Note that the atanFast4 he provide is the polynomial of degree 3 alternate I provide here but without the undo range reduction, thus in the range [-1, 1]. Also it is actually 7 FR not 12 FR as say in the comment and the maximum error is wrong too. Remark 3: atan2 can be implemented with the atan identity use for the odd polynomial alternate. The generated polynomial Minimax coefficients are typically computed using high-precision arithmetic. It is well-known that simply rounding those coefficients to machine precision leads to suboptimal accuracy in the resulting implementation, see documentation of lolremez “Remez tutorial 5/5: additional tips”  for an example. That mean a simple epsilon change due to rounding to float in the coefficient can increase the absolute error. Mathematica work with machine precision by default which is good for us, but it is double not float. I haven’t been able to find a way to force Mathematica to work with float representation. However I have done some test to compare rounding to float and double coefficients accuracy for the GPU inverse trigonometric functions of this post and the error increase is too small to matter. All coefficients I provide here are representable in float and doesn’t change significantly enough the max error to require special treatment. In case you are interested of minimizing with floating-point accuracy, documentation of lolremez  provide an example. Brisebarre and al. 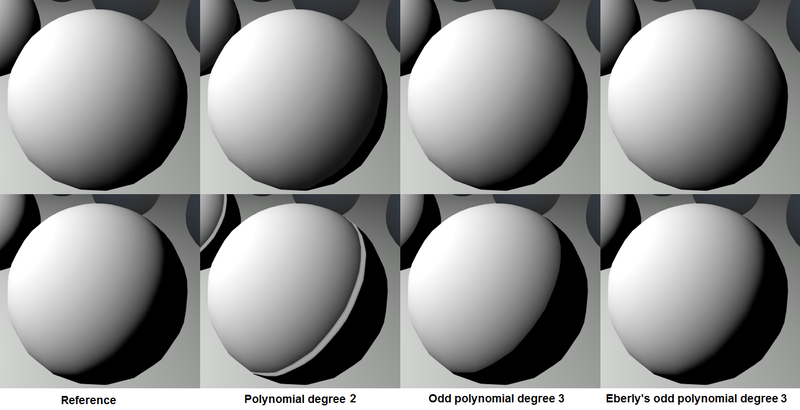 also describe a method to do floating minimax approximation  which is implemented in the Sollya software. Here are the Mathematica files including all the code and diagram of this post, one pdf: GPUInverseTrigoForGCN_v3 and the notebook :GPUInverseTrigoForGCN_nb_v3 (Right click, save, rename “.pdf” to “.nb” as wordpress don’t support zip files). To conclude this long post, we have seen that we have plenty of control on the accuracy and performance of the approximation of inverse trigonometric functions. But keep in mind that the final code must be a win on GPU compare to the original code, else it is useless. We have observe that we should not rely on macro instruction like acos/asin/atan provide by the GPU compiler because they are too generalist. We must provide our own for our use case. The second lesson is that we should always check visually if an approximation is good. Numbers don’t detect edge case. This is a win. Not using default macro instructions reduce the number of VGPR usage in all cases. Remind to only use the required function which fit your case, ATanPos save 2 FR compare to ATan. Also keep in mind that if you use multiple call to the same inverse trigonometric function, the compiler can factor a bit the code. For example the solid angle of a rectangle light requiring 4 acos call is 42 FR (26 FR, 4QR) and not 48 FR. For my diffuse sphere area light, I use Eberly’s ATan above and the minimize absolute error of degree 1 Acos version of this post and it work very well. To conclude, the algorithm approach describe in this post can be apply to any functions, inverse trigonometric functions are just a subset of what you can do. See  for various example. Mistake in asin approximation function: inversion of PI/2 – Asin(X), with PI/2 – Asin(X). Re-upload as V2 and update the post. Rewrite a large part of the post to take into account various feedback. – approximation for both minimizing relative error or maximum absolute error. – alternate version of ATan cheaper base on specific atan identity. Various remark. New cleaner and more detailed Mathematica files.